I’ve been buying lamps when I see them in 2nd hand shops lately. When I see one I like the shape of. Sometimes I like the shade, other times the base. Often I get them home and swap shades or paint bases… I think I have too many lamps. 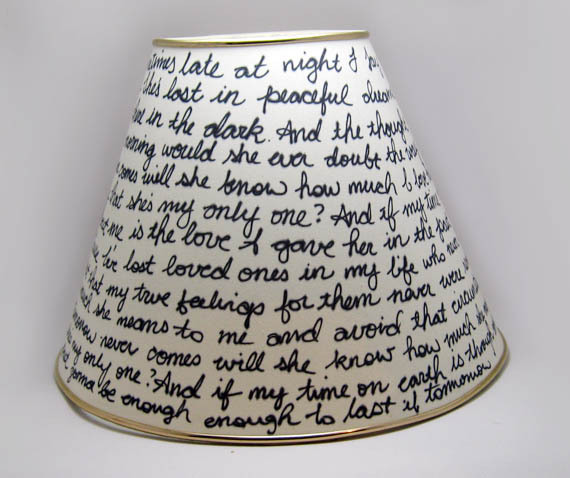 However, when I saw this letter on a lampshade it inspired me to do something with a shade I had removed cause I didn’t like the gold trim. There was a little damage too – two of the metal frame spikes inside had come loose and poked tiny holes on the shade. I glued the spikes back into place and the writing camouflaged the tiny holes. I used a sharpie to write Garth Brook’s If Tomorrow Never Comes on the shade as its always been one of my favourite songs. Its one of the best love songs ever in my opinion – for anyone at all in your life. My handwriting leaves a lot to be desired. I’ve never used cursive. In schools in Australia children are taught to ‘print’ not ‘write’. That means that we learn to write single letters. Later we’re taught to join them up, but the Australian way of ‘running writing’ is nothing like American cursive. Its simple, economical in stroke and rather plain compared to the flair of cursive. When we moved to Greece in 1970 I went to Ursuline (an American Catholic school run by the Ursuline nuns) and had to learn cursive. Funny huh? My printing wasn’t good enough so I had to sit in the classroom for many lunchtimes learning cursive. I used it for about 4 years, till I went to the English Campion School for high school where cursive was knocked out of me by one of my teachers. He had me go back to my ‘much neater’ printing. Thus, in my long winded way, I’m explaining that my cursive is very rusty as it never gets out these days. 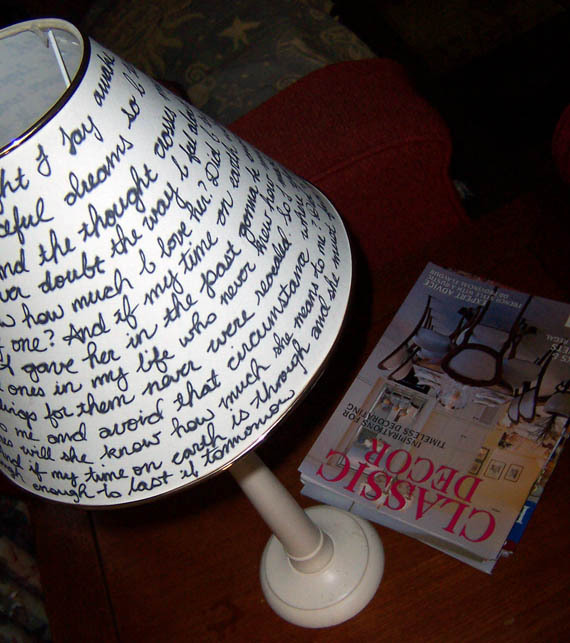 And bringing it out to write on a round lampshade was a challenge. 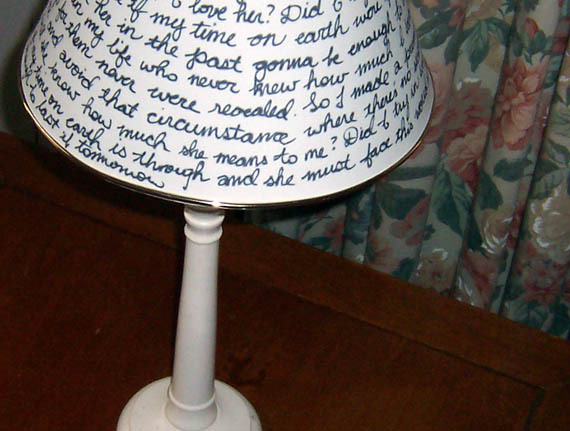 Still, if you can look past the wonky handwriting, I think the lamp came up well. I paired it with a plain creamy wooden base. Hopefully no one will look too closely at the actual writing. Maybe I’ll put it back on its original gold base, but for now it sits on the corner coffee table in the living room. 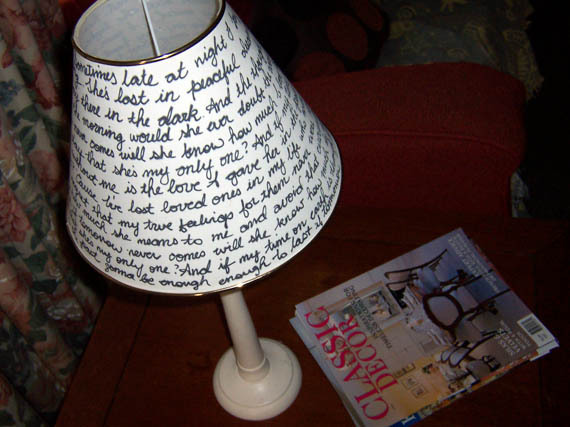 I think your lampshade is wonderful! I have never heard of “running writing” but I definitely think it should be it's own font! Thanks for the sweet words on my blog!